Use the CTAT Disk Log Converter to convert a CTAT disk log to a more readable XML format. When disk logging is enabled, CTAT produces log files that are heavily escaped so that the bulk of the XML can be transported inside another XML element. This XML-within-XML format is very difficult for a human to read. The CTAT Disk Log Converter "unescapes" the XML and provides some reasonable spacing to make the XML format easier to read. Note: The CTAT Disk Log Converter is unsupported software. It is primarily an internal tool which we are providing for those who want to more easily examine the disk logs CTAT creates. We are providing it without warranty, but feel free to email any questions to our Google Group, keeping in mind that turnaround may be slow. 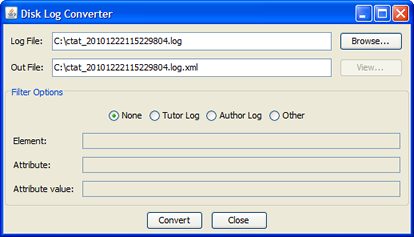 To use the converter, browse for a log file to convert. The output file will automatically fill in for you, but you can modify the file name. For Filter Options, in most cases you can just leave the default of "None". If you want to only look at tutor messages (log messages describing tutoring between the tutor and student), select "Tutor Log". If you want to only look at author messages (log messages describing how someone used CTAT to build a tutor), select "Author Log". The "Other" option allows you to specify a particular element, attribute, or attribute value to include in the converted log. To convert the file, press Convert.